Faults grow from micro-fractures or deformation band zones and accumulate displacement over time as deformation proceeds. Moreover, faults tend to nucleate at many different places as a region is critically stressed, for instance during rifting, and we refer to such groups of faults as fault populations. In general, many faults in a population soon become inactive and thus remain small. Others reach an intermediate stage before dying, while a few grow into long faults with large displacements. Hence, a fault population is always dominated by small faults, while additional long faults develop as strain accumulates. Faults are unlikely to grow as individual structures over a long period of time. As they grow, they are likely to interfere with nearby faults. In this way two faults can join to form a single and much longer fault. Growth by linkage is a very common mechanism that creates some of the most interesting and important structures in faulted regions. In a population where faults grow in length and height, faults and their surrounding stress and strain ﬁelds will locally interfere. Let us consider two faults whose tips approach each other during growth. Before the tips have reached each other (but after their strain ﬁelds have started to interfere) the faults are said to under lap. Once the tips have passed each other, the faults are overlapping. Under and overlapping faults are said to be soft linked as long as they are not in direct physical contact. Eventually the faults may link up to form a hard link. Under lapping faults “feel” the presence of a neighbouring fault tip in the sense that the energy required to keep the deformation going increases. The propagation rate of the fault tips in the area of under lap is thus reduced, which causes the local displacement gradient to increase. This results in asymmetric displacement proﬁles, where the maximum is shifted toward the overlapping tip. This asymmetric displacement distribution becomes more pronounced as the faults overlap and the layers in the overlap zone become folded. The folding is a result of ductile displacement transfer (relay) from one fault to the other and is directly related to the high displacement gradients in the overlapping tip zones. If the fault interference occurs perpendicular to the slip direction, which for normal and reverse faults means in the horizontal direction, and if the layering is subhorizontal, then the folding is well expressed in the form of a ramp-like fold. The fold itself is called a relay ramp and the entire structure is known as a relay structure. The ramp is a fold that may contain extension fractures, shear fractures, deformation bands and/or minor faults depending on the mechanical rock properties at the time of deformation. Eventually the ramp will break to form a breached relay ramp. The two faults are then directly connected and associated with an abnormally wide damage zone. Upon breaching there will be a displacement minimum at the location of the relay structure. The total displacement curve along the fault will therefore show two maxima, one on each side of the relay structure. As the deformation proceeds and the fault accumulates displacement, the displacement proﬁle will approach that of a single fault, with a single, central maximum. However, the link is still characterized by the wide damage zone and a step in the horizontal fault trace. If the mapping is based on poorly constrained outcrop information or seismic data (which always have a resolution issue), a sudden change in strike may be the only indication of a breached ramp. Such steps, seen at many locations in the seismic interpretation, are therefore very important as they may hint at the locations of both breached and intact relay ramps. Bends and jogs of faults in map view are very common on many scales. The ﬁnal fault geometry can be seen to be the result of interaction between individual fault segments through the creation and breaching of relay ramps. The curved fault pattern seen in map view is very similar to that displayed by much larger faults, such as the northern North Sea faults and the Wasatch Fault in Utah, so it seems likely that these large faults formed by fault linkage. Assuming that this analogy holds, we are now able to interpret a deformation history from the geometry of a dead fault system. It is clear that ramps come in any size and stage of development. It is also important to understand that relay ramps and overlap zones are formed and destroyed continuously during the growth of a fault population. Fault growth by linkage involves the formation and destruction of relay structures, deviations from the ideal elliptical displacement distribution and generation of wide damage zones and fault bends at locations of linkage. Relay ramp formed between two overlapping fault segments in Arches National Park, Utah. Faults grow in the directions both normal and parallel to the slip direction and therefore interfere in both the vertical and horizontal directions. In the previous section we looked at the horizontal interaction of normal fault tips. Now we will look at the interference of normal fault tips in the vertical plane, i.e. parallel to the slip vector. Fault linkage is most commonly recognized and described in map view, but this is simply because they are easier to observe in map view. Tall vertical sections are less common than long horizontal exposures, and the continuity of good seismic reﬂectors in the horizontal direction makes it easier to map relays in map view than in the vertical direction. It takes a whole package of good reﬂectors to identify and map vertical overlap zones on seismic sections. There is therefore a good chance that vertical relay zones are under represented in seismic interpretations. Faults initiate after a certain amount of strain that depends on the mechanical properties (Young’s modulus, etc.). As strong rock layers start to fracture, weak rocks continue to accumulate elastic and ductile deformation. As these fractures grow into faults, they will interfere and connect. In many cases sandstones become faulted before shales. The process is similar to that occurring in map view, except that the angle between the displacement vector and the layering is different. The rotation depends on fault geometry and how the faults interfere. Restraining overlap zones are, in this connection, overlap zones with shortening in the displacement direction. In principle, volume reduction may accommodate the deformation within the zone. More commonly, however, the layers within the overlap zone rotate. Releasing overlap zones are zones where the fault arrangement and sense of displacement cause stretching within the overlap zone. Weak layers such as shale or clay layers are rotated within releasing overlap zones. If the overlap zone is narrow, such weak layers can be smeared along the fault zone. Field observations show that this is a common mechanism for the formation of clay smear in sedimentary sequences, but usually on too small a scale to be detected from seismic data. Such structures may cause faults to be sealing with respect to ﬂuid ﬂow, which can have important implications in petroleum or groundwater reservoirs. Layering or mechanical stratigraphy is important as fault populations develop in layered rocks. The timing of fault formation in the different layers is one aspect, and the way that faults form (ordinary fracturing versus faulting of deformation band zones) is another. Mechanical stratigraphy simply implies that the rock consists of layers that respond mechanically differently to stress, i.e. they have different strengths and different Young’s moduli (E). In simple terms, some layers, such as clay or shale, can accommodate a considerable amount of ductile strain, while other layers, such as limestone or cemented sandstone, fracture at much lower amounts of strain. The result is that, in a layered sequence, fractures or deformation bands initiate in certain layers, while adjacent layers are unaffected or less affected by such brittle structures. So long as the deformation band or fracture grows within a homogeneous layer, a proportionality exists between maximum displacement, length and height. Once the fracture touches the layer boundaries it is called a vertically constrained fracture, and the fracture will only expand in the horizontal direction. This means that the fracture gets longer and longer while its height remains constant, i.e. its eccentricity increases. In fact, its shape is likely to become more rectangular than elliptical. The moment a fracture is constrained, its area increases only by layer-parallel growth, and its displacement/ length (D/L) ratio becomes lower than what it was during its unconstrained growth history. In simple terms, this is because displacement scales with fracture area, and since the fracture area only increases along its length, the length has to increase at a faster rate relative to displacement. Eventually, if the fracture keeps accumulating displacement, it will break through the bounding interface and expand into the overlying/underlying layers. The D-L relationship will then return to its original trend. The same development is seen for deformation bands in sandstone-shale sequences. At a critical point the deformation band cluster in the sandstone is cut by a slip surface (fault) that extends into the over and/or underlying shale. Fault formation and growth is a complicated process involving a frontal process zone where micro-fractures form and eventually connect. 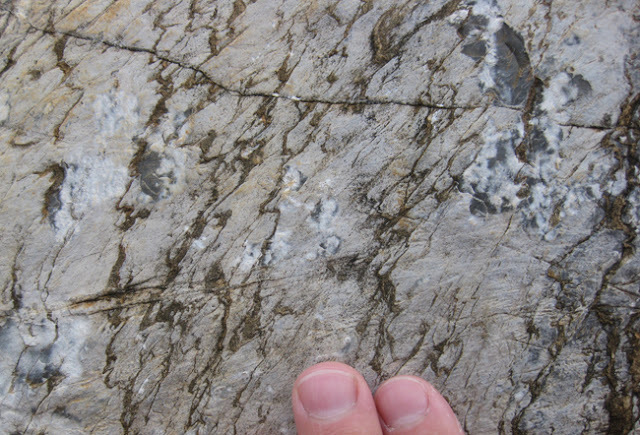 Faults in rocks with low or no porosity somehow grow from small shear fractures. However, this cannot happen directly from a single shear fracture, since shear fractures cannot expand in their own planes. Instead they will curve and form wing cracks or related cracks across which there is tension. Experiments show that a phase of intense micro-fracturing occurs prior to fracture initiation or propagation. Once the density of micro-fractures reaches a critical level, the main fracture expands by linkage of favourably oriented micro-fractures. The zone of micro-fractures (and meso-fractures) ahead of the fracture tip zone is called the frictional breakdown zone or the process zone. For a fault to develop, a number of small shear fractures, tensile fractures and hybrid fractures must form and connect. The incipient fault surface is irregular, leading to grinding and micro-fracturing of the walls. A thin core of brecciated or crushed rock typically forms. During fault growth, new fractures form in the walls next to the fault core. Hence, most faults have a well-deﬁned core of intense cataclastic deformation and a surrounding damage zone of less intense fracturing. Natural rocks are not isotropic, and in many cases faults form along pre-existing mesoscopic weaknesses in the rock. Such weaknesses can be layer interfaces or dikes, but the structures that are most likely to be activated as faults are joints (and, of course, pre-existing faults). Joints tend to be very weak planar structures with little or no cohesion. Joints may also form surfaces many tens of meters or more in length and/or height, because as extension structures they have had the freedom to expand in their own plane. 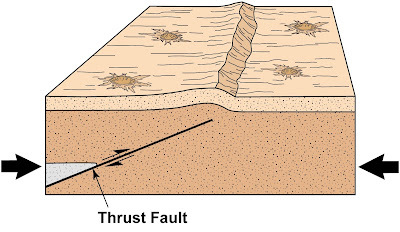 Faults formed by faulting of joints inherit some of the features of the original joints. 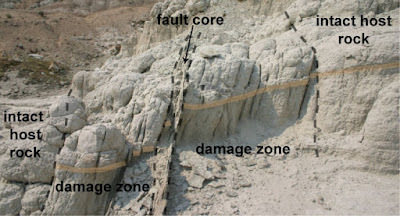 If a fault forms by frictional sliding on a single, extensive joint, the initial fault tends to be a sharp slip surface with almost no fault core and with (almost) no damage zone. If slip accumulates, however, the fault outgrows the joint and links with other joints in the vicinity of its tip zone. The damage zone then thickens, and the fault core may grow. Fault formation by joint reactivation requires less stress, causes less off-fault damage (narrower damage zone) and may result in a lower displacement gradient along the fault. In highly porous rocks and sediments, fault growth follows a somewhat different path. Pore space gives the grains a unique opportunity to reorganize. If the grains in a sandstone are weakly cemented together, then the grains will reorganize by rotation and frictional grain boundary sliding (translation) during deformation. In other cases grains can also break internally. In either case, the deformation is likely to localize into narrow zones or bands to form structures known as deformation bands. Field observations, as well as experimental and numerical work, show that deformation proceeds by sequential formation of new deformation bands adjacent to the initial one. This means that at some point it becomes easier to form a new band next to the existing one than to keep shearing the primary band. The result is a deformation band zone, and this development is commonly explained in terms of strain hardening. Strain hardening is thought to be related to the loss of porosity in the band and is most pronounced where grains are crushed (cataclastic bands). Note the difference between process zones in non-porous and highly porous rocks: The process zone in non-porous rocks weakens the host rock and increases porosity by the formation of cracks. In high porosity rocks the deformation bands in the process zone in many cases harden the rock and reduce porosity. Once a certain number of deformation bands have accumulated in the deformation band zone, porosity is sufﬁciently reduced that a slip surface can form and grow. Slip surfaces nucleate in small patches that propagate, link up, and ultimately form through-going slip surfaces. Mechanically, slip surfaces are weak structures that relatively quickly can accumulate meters of slip or more. Through-going slip surfaces are commonly associated with a thin (millimeter-thick) zone of ultracataclasite, which may be considered as the local fault core. Faults in highly porous rocks form in precursory deformation band zones. The growth of deformation bands and/or ordinary fractures prior to the formation of a through-going slip surface has implications for our understanding of the damage zone. The moment the slip surface (fault) forms, the enclosing zone of already existing structures will become the damage zone. Once the fault is established, the process zone in front of the fault tip moves ahead of the fault tip as the fault expands, leaving behind a zone that becomes the initial fault damage zone. In a porous rock, this zone is likely to consist of deformation bands. Because faults form in porous rocks by faulting of a deformation band zone, the length of the deformation band process zone tends to be longer than the process zone seen in many non-porous rocks. This is particularly true if the deformation bands are cataclastic, in which case the process zone can be several hundred meters long. If the structures of the damage zone form ahead of a propagating fault tip, then the damage zone should be slightly older than the associated slip surface. A consequence of this assumption would be that the width and strain of a damage zone are independent of fault displacement. Empirical data show that this is not the case, even though the fault (slip surface) represents the weakest part of the rock and is therefore prone to reactivation without the creation of more side wall damage. The reason is simply that faults are not perfectly planar structures, nor do they expand within a perfect plane. Faults are irregular at many scales because the rocks that they grow in are both heterogeneous and anisotropic. For example, faults may bend as they meet a different lithologic layer or as they link with other faults. The structures in the damage zone form both prior to, during and after the local formation of the slip surface (fault). If the fault is temporarily or locally planar and smooth, then there may be periods during which displacement accumulates without any deformation of the wall rocks, i.e. without any widening of the damage zone. However, at locations of fault linkage or fault bends, wall damage may also occur during fault growth, which leads to a local widening of the damage zone. Eventually, the fault may ﬁnd a more planar way through zones of complications, and the damage zone becomes inactive again. Thus, the growth of damage zones may be temporal and local, contributing to the scatter. Drag is best deﬁned as any systematic change in the orientation of layers or markers adjacent to a fault in a way that makes it clear that the change deﬂection is genetically related to the fault. Commonly, the term drag describes zones some meters or tens of meters wide. However, hanging-wall synclines related to normal faults in continental rift basins can extend several hundred meters into the hanging wall. Similarly, large-scale roll overs (reverse drag), up to several kilometres long on the hanging-wall side are associated with large listric faults. 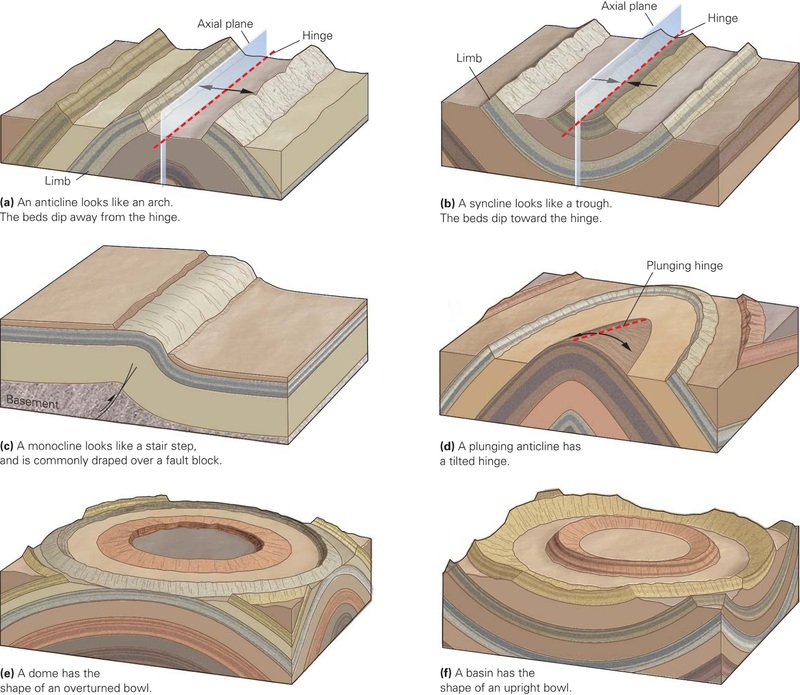 Drag is folding of layers around a fault by means of brittle deformation mechanisms, directly related to the formation and/or growth of the fault. There are two geometrically different types of drag: normal drag and reverse drag. Normal drag is the shear zone-like geometry where layers ﬂex toward parallelism with the fault. Normal drag involves displacement, so that the total offset is the sum of the ductile normal drag and the discrete fault displacement. Reverse drag is used for the usually larger-scale roll over structures that occur on the hanging-wall side of listric normal faults. In this case the layers are concave in the slip direction. 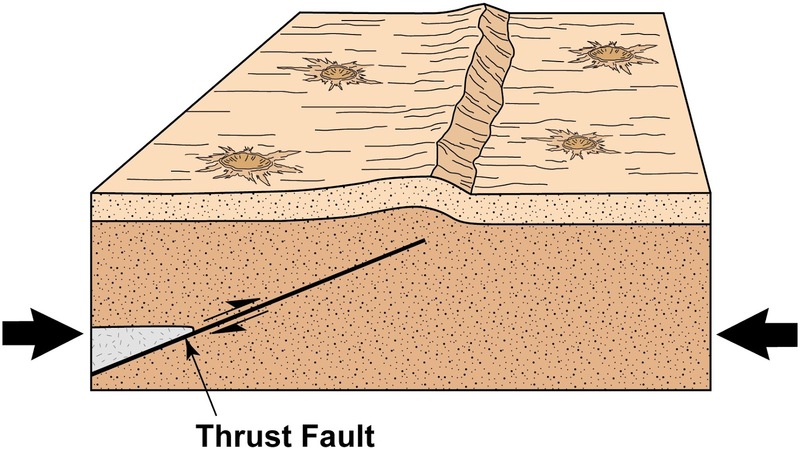 Both normal and reverse drag occur along faults, depending on the local fault geometry. It was originally thought that drag was the result of friction along the fault during fault growth, but the term now includes bending of the layers prior to fault formation. The latter model seems to ﬁt many examples of drag. 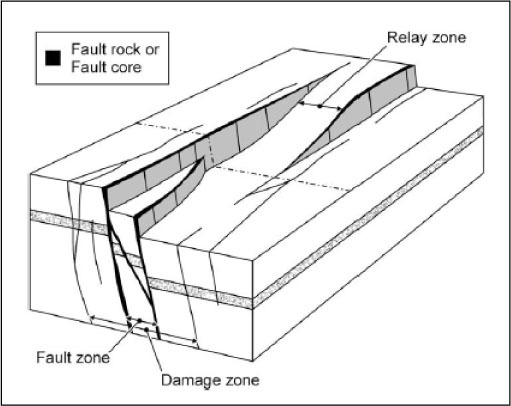 This model is similar to that of damage zone development: in both cases layers are deformed in the wake of the fault tip. The difference is that drag folding is ductile down to a certain scale, commonly that of a hand sample. The geometry of a drag fold contains information about how it formed. A drag fold in which the layers have the same geometry along the fault, with constant width of drag zone dip isogons running parallel to the fault trace, can be modelled by simple shear. In this case we have a simple shear zone with a central discontinuity. In other cases the drag zone is upward-widening, and a different kinematic model must be applied. A popular model is called trishear. In this model strain is distributed in a triangular or fan-shaped zone of active deformation ahead of the fault tip. This zone moves through the rock as the fault propagates, and no further folding occurs once the fault has cut through the layers. The width of the triangular deformation zone varies from case to case, but in all cases the drag zone widens up section. This model seems to work particularly well in places of reactivated basement faults that grow into overlying sedimentary strata. Many examples of such structures are found in the uplifts on the Colorado Plateau and in the Rocky Mountains foreland in Wyoming and Colorado, where the fold structures are commonly referred to as forced folds. Folds that form ahead of a propagating fault tip are called fault propagation folds. Thus, many drag folds are faulted fault propagation folds. However, drag can also form or become accentuated in the walls of an already existing fault. Just like the damage zone, fault drag can develop due to locking of the fault at fault bends, fault linkage and other complications that can increase the friction along faults. The latter mechanism can take drag to the point where the rotated layer, which typically consists of clay or shale, forms a smear along the fault. Drag can occur by granular ﬂow, particularly in poorly lithiﬁed sediments. Granular ﬂow leaves little or no trace of the deformation except for the rotation of layering or modiﬁcation of sedimentary structures. In consolidated sedimentary rocks grains may start to fracture, and the mechanism becomes distributed cataclastic ﬂow. The mechanisms are the same as those that operate in the different deformation bands discussed in the previous chapter, but the deformation during drag folding is less localized and strain is generally lower. There is, however, a strain gradient toward the fault. Fractures or deformation bands may occur in drag zones. In such cases the density of fractures or deformation bands increases toward the fault. The appearance of mesoscopically mappable fractures or deformation bands indicates that we are in the damage zone. Where drag folds are well developed, the drag zone tends to be wider than the damage zone, although the opposite situation also occurs. Some faults, particularly in metamorphic rocks, show drag-like folding of the layering. A closer examination of many such “drag” folds reveals that they are controlled by plastic deformation mechanisms and are thus shear zones around faults that could have formed in a variety of ways, generally in the zone of brittle–plastic transition. We generally do not consider such plastic fold structures as drag folds, although the similarity can be striking. Once a fault surface is established it will represent a mechanically weak structure that is likely to fail again during renewed stress build-ups. Faults grow by two mechanisms. The most common one is called stick-slip, where slip accumulates at very sudden seismic slip events, separated by periods of no slip. Stress builds up between the slip events until it exceeds the frictional resistance of the fault. This is the model used to understand earthquakes, where each slip event causes an earthquake whose magnitude is related to the amount of energy released during the stress drop. In terms of strain, this is related to the amount of elastic strain that is released as the fault moves. It is worth noting that the accumulation of such displacements would take thousands or millions of years, depending on the local displacement rate. Throw rates for faults can be found by dating sedimentary layers that are offset and measuring their displacements. Average displacement rates of around 1–10 mm/year have been published for major faults in tectonically active areas. Large faults tend to slip along just a limited portion of the total fault surface. 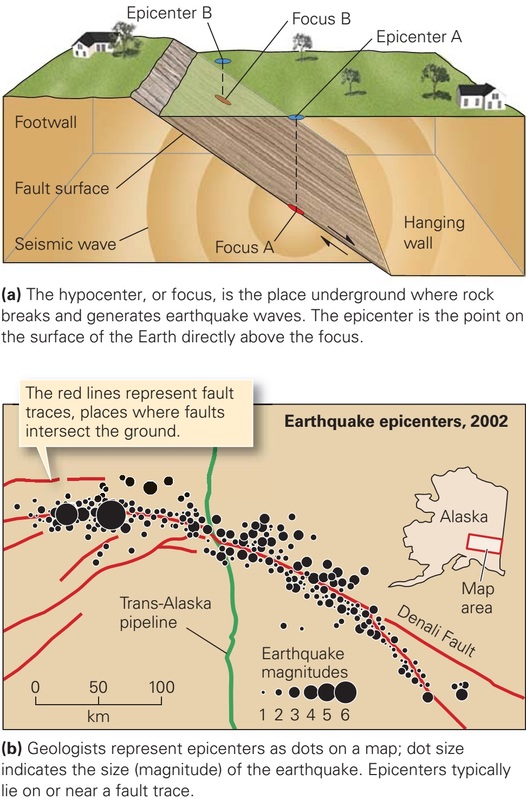 The total displacement distribution for a large fault is therefore the sum of displacements contributed by individual slip events (earthquakes). While it seems clear that single slip events produce more or less elliptical displacement contours, the ﬁnite displacement distribution from a large number of slip events (earthquakes) is more difﬁcult to predict or understand. The characteristic earthquake model assumes that each slip event is equal to the others in terms of slip distribution and rupture length. However, the location of the displacement maximum is shifted for each slip event. The variable slip model predicts that both the amount of slip and the rupture length vary from event to event, while the uniform slip model considers the slip at a given point to be the same in each slip event (the area varies). We will not go into the details of these models here, but simply state that displacement accumulation results in a displacement maximum near the middle of the fault, gradually tapering off toward the tips. The production of organic matter is not limited by carbon dioxide or water, but by nutrient availability. Phosphorus (P) and nitrogen (N) are the most important nutrients, though the supply of iron can also be limiting for alga production. It is this process of photosynthesis, which started 4 billion years ago, that has built up an atmosphere rich in oxygen while accumulating reduced carbon in sedimentary rocks as oil, gas and coal. Most of the carbon is nevertheless ﬁnely divided within sedimentary rocks, for example shales and limestones, in concentrations too low to generate signiﬁcant oil and gas. Energy stored by photosynthesis can be used directly by organisms for respiration. This is the opposite process, breaking carbohydrates down into carbon dioxide and water again, so that the organisms gain energy. This occurs in organisms at night when there is no light to drive photosynthesis. Also when we burn hydrocarbons, e.g. while driving a car, energy is obtained by oxidation, again essentially reversing the photosynthesis equation quoted above. Oxidation of 100 g glucose releases 375 kcal of energy. Carbohydrates that are produced but not consumed by respiration can be stored as glucose, cellulose or starch in the cell walls. Photosynthesis is also the biochemical source for the synthesis of lipids and proteins. Proteins are large, complex molecules built up of condensed amino acids (e.g. glycine (H2NCH2−COOH)). 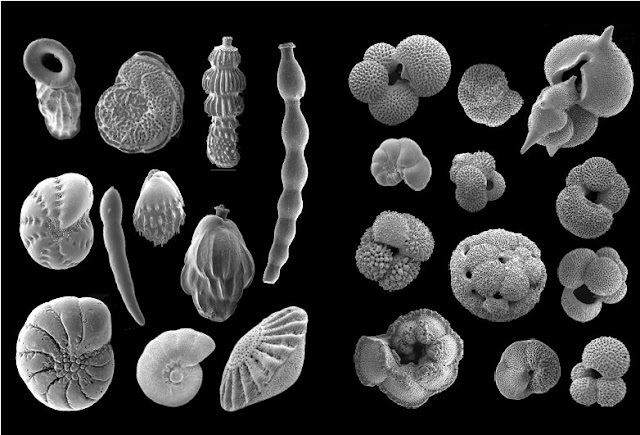 Dried phytoplankton contains 45–55% carbon, 4.5–9% nitrogen, 0.6–3.3% phosphorus and up to 25% of both silica and carbonate. Planktonic algae are the main contributors to the organic matter which gives rise to petroleum. Among the most important are diatoms, which have amorphous silica (opal A) shells. 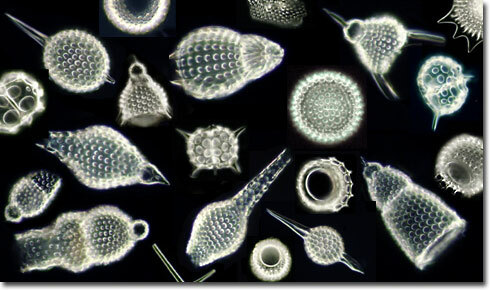 Radiolaria – silica shells, wide distribution, particularly in tropical waters. Foraminifera – shells of calcium carbonate. 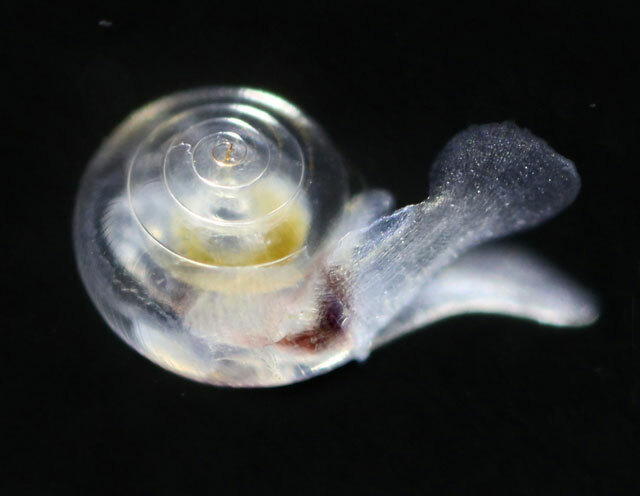 Pteropods – pelagic gastropods (snails) with a foot which has been converted into wing-shaped lobes; carbonate shells. This is the second lowest level within the marine food chain. These zooplanktonic organisms are eaten by crustaceans which themselves are eaten by ﬁsh. The total amount of organic matter that can be produced in the ocean is dependent on the nutrient supply from rivers, but river water does not only carry inorganic nutrients. It also contains signiﬁcant amounts of organic matter, in particular humic acid compounds, lignin and similar substances formed by the breakdown of plant material which are weakly soluble in cold water. When the river water enters the sea, there is precipitation due to the increased pH and lower surface temperature in the ocean. Other plant materials, like waxes and resins, are more chemically resistant to breakdown and are insoluble in water. Such organic particles tend to attach themselves to mineral grains and accompany sediment out into the ocean. Most of the oil reservoirs which have been formed since the Palaeozoic have been uplifted and eroded, and over time vast quantities of oil have ﬂowed (seeped) out onto the land or into the sea. In this sense, oil pollution is a natural process. Only a small proportion of the petroleum that has been formed in source rocks has actually become trapped in a reservoir. One might expect this seepage to have provided a source of recycled petroleum in younger sediments, but petroleum breaks down extremely rapidly when subjected to weathering, oxidising to CO2, and the nutrients (P, N) that were required to form the organic matter are released and may act like a fertilizer. On land, evaporation will remove the lighter components while bacteria will degrade the heavier components. Fossil asphalt lakes consist of heavy substances which neither evaporate nor can be easily broken down by bacteria. In the ocean, the lighter components will dissolve quite rapidly, while the heavier asphalt fraction will sink to the bottom and be degraded and recycled. In uplifted sedimentary basins like the Ventura Basin and the Los Angeles Basin in Southern California there are abundant natural oils seeps both onshore and offshore. On the beaches from Santa Barbara towards Los Angeles there are many natural oil seeps. The branch of geology that has the greatest economic importance worldwide is the study of fossil fuels (coal, oil and natural gas): they form by diagenetic processes that alter material made up of the remains of organisms. The places where the original organic material forms can be understood by studying depositional processes, but the formation of coal from plant material and the migration of volatile hydrocarbons as oil and gas require an understanding of the diagenetic history of the sedimentary rocks where they are found. Vegetation on the land surface is usually broken down either by grazing animals or by microbial activity. Preservation of the plant material is only likely if the availability of oxygen is restricted, as this will slow down microbial decomposition and allow the formation of peat, which is material produced by the decay of land vegetation. In areas of standing or slowly flowing water conditions can become anaerobic if the oxygen dissolved in the water is used up as part of the decay process. These waterlogged areas of accumulation of organic material are called mires, and are the principal sites for the formation of thick layers of peat. Mires can be divided into two types: areas where most of the input of water is from rainfall are known as ombotrophic mires or bogs; places where there is a through-flow of groundwater are called rheotrophic mires or swamps. In addition there are also rheotrophic mires that have an input of clastic sediment, and these are referred to as marshes, or salt marshes if the water input is saline. The significance of these different settings for peat formation is that these environmental factors have a strong influence on the quality and economic potential of a coal that might subsequently be formed. Bogs tend to have little clastic input, so the peat (and hence coal) is almost pure plant material: the peat can be many metres thick, but is usually of limited lateral extent. Swamp environments can be more extensive, but the through-flowing water may bring in clay, silt and sand particles that make the coal impure (it will have a high ash content). Also, if the water is saline, it will contain sulphates and these lead to the formation of sulphides (typically iron pyrite) in the coal and give the deposit a high sulphur content: this is not desirable because it results in sulphur dioxide emissions when the coal is burnt. The ash and sulphur content are the two factors that are considered when assessing the coal grade, as the lower they are, the higher the grade. A wet environment is required to form a mire and therefore a peat, so environments of their formation tend to be concentrated in the wetter climatic belts around the Equator and in temperate, higher latitudes. In warmer climates plant productivity is greater, but the microbial activity that breaks down tissue is also more efficient. Both plant growth and microbial breakdown processes are slower in cooler environments, but nevertheless the fastest rates of peat accumulation (over 2mm yr 1) are from tropical environments and are ten times the rate of peat accumulation in cooler climes. Coals that originate as peat deposits are known as humic coals, but not all coals have this origin. Sapropelic coals are deposits of aquatic algae that accumulate in the bottoms of lakes and although they are less common, they are significant because they can be source rocks for oil: humic coals do not yield oil, but can be the origins of natural gas. The first stage of peat formation is the aerobic, biochemical breakdown of plant tissue at the surface that produces a brownish mass of material. This initially formed peat is used as a fuel in places, but has a low calorific value. The calorific value is increased as the peat is buried under hundreds of metres of other sediment and subjected to an increase in temperature and pressure. Temperature is in fact the more important factor, and as this increases with depth (the geothermal gradient) the peat goes through a series of changes. Volatile compounds such as carbon dioxide and methane are expelled, and the water content is also reduced as the peat goes through a series of geochemical changes. As oxygen, hydrogen and nitrogen are lost, the proportion of carbon present increases from 60% to over 90%, and hence the calorific value of the coal increases. Differences in the degree to which the original peat has been coalified are described in terms of coal rank. Transitional between peat and true coal is lignite or brown coal, which is exploited as an energy source in places. Going on through the series, low-rank coal is referred to as sub-bituminous coal, middle rank is bituminous and the highest rank coals are known as anthracite. In the process of these reactions, the original layer of peat is reduced considerably in thickness and a bed of bituminous coal may be only a tenth of the thickness of the original layer of peat. Naturally occurring oil and gas are principally made up of hydrocarbons, compounds of carbon and hydrogen: petroleum is an alternative collective term for these materials. The hydrocarbon compounds originate from organic matter that has accumulated within sedimentary rocks and are transformed into petroleum by the processes of hydrocarbon maturation. This takes place in a series of stages dependent upon both temperature and time. The first stage is biochemical degradation of proteins and carbohydrates in organic matter by processes such as bacterial oxidation and fermentation. This eogenesis eliminates oxygen from kerogen, the solid part of the organic matter that is insoluble in organic solvents. Type I is derived from planktonic algae and amorphous organic material and is the most important in terms of generating oil. Type II consists of mixed marine and continental organic material (algae, spores, cuticles) which forms gas and waxy oils. Type III originates from terrestrial woody matter and is a source of gas only. 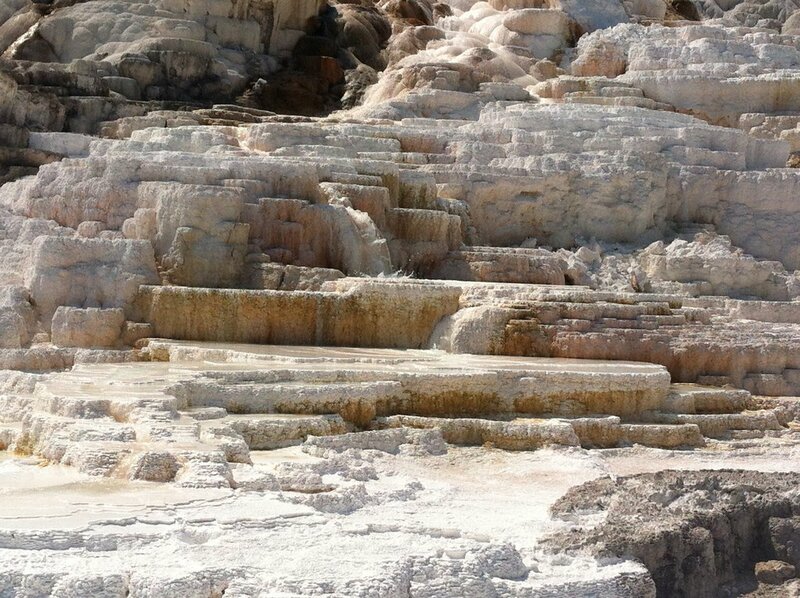 Eogenesis occurs at temperatures of up to 408 C and at up to depths of just over 1000 m. At burial depths of between about 1000 and 4000 m and at temperatures of between 408 C and 1508 C, the phase of diagenesis known as catagenesis further transforms the kerogen. This stage of thermal maturation is also known as the ‘oil window’ because liquid petroleum forms from Type I kerogen under these conditions. With increasing temperature the proportion of gas generated increases. Generation of oil by organic maturation of kerogen is a process that requires millions of years, during which time the strata containing the organic matter must remain within the oil window of depth and temperature. At higher temperatures and burial depths only methane is produced from all kerogen types, a stage known as metagenesis. Formation of oil, which is made up of relatively long-chain hydrocarbons that are liquid at surface temperatures, from sedimentary organic matter requires a particular set of conditions. First, the organic matter must include the remains of planktonic algae that will form Type I kerogen: this material normally accumulates in anaerobic conditions in anoxic marine environments and in lakes. Second, the organic material must be buried in order that catagenesis can generate liquid hydrocarbons within the correct temperature window: if buried too far too quickly only methane gas will be formed. The third factor is time, because the kerogen source rock has to lie within the oil window for millions of years to generate significant quantities of petroleum. Gas consisting of short-chain hydrocarbons, principally methane, is formed from Type III kerogen and at higher maturation temperatures. Burial of coal also generates natural gas (principally methane) and no oil. The methane generated from coal may become stored in fractures in the coal seam as coal bed methane, which is a hazard in underground coal mining, but can also be exploited economically. The hydrocarbons generated from kerogen are compounds that have a lower density than the formation water present in most sedimentary successions. They are also immiscible with water and droplets of oil or bubbles of gas tend to move upwards through the pile of sedimentary rocks due to their buoyancy. This hydrocarbon migration proceeds through any permeable rock until the oil or gas reaches an impermeable barrier. Oil and gas become trapped in the subsurface where there is a barrier formed by impermeable rocks, such as well-cemented lithologies, mudrock and evaporite beds. These impermeable lithologies are known as cap rocks. The hydrocarbons will find their way around the cap-rock barrier unless there is some form of hydrocarbon trap that prevents further upward migration. Structural traps are formed by folds, such as anticlines, especially if they are domeshaped in three dimensions, and by faults that seal a porous reservoir rock against an impermeable unit. Other traps are stratigraphic traps, formed beneath unconformities and in places where the reservoir rock pinches out laterally: porous rocks such as limestone reefs that pass laterally into finer grained deposits and where sand bodies are laterally limited and enclosed by mudrocks are examples of stratigraphic traps. The size and shape of the trap determines the volume of oil and/or gas that is contained by the structure, and hence is an important factor in assessing the economics of a potential oil field. In the absence of traps and caps the hydrocarbon reaches the surface and leaks to the atmosphere. Partial release of hydrocarbons from the subsurface as oil seeps and gas seeps can be important indicators of the presence of hydrocarbons. minerals in the pore spaces, sometimes to the extent of reducing the porosity to zero. Exploration for economic reserves of hydrocarbons requires knowledge of the depositional history of an area to determine whether suitable source rocks are likely to have formed and if there are any suitable reservoir and cap lithologies in the overlying succession. This analysis of the sedimentology is an essential part of oil and gas exploration. Knowledge of postdepositional events is also important to provide an assessment of the thermal and burial history that controls the generation of hydrocarbons. Cements in carbonate rocks are mainly made up of calcium carbonate derived from the host sediment. Lithification of aggregates of carbonate material can occur as eogenetic cementation contemporaneously with deposition in any settings where there is either a lot of seawater being circulated through the sediment or where sedimentation rates are low. Beach-rock may be formed of carbonate debris deposited on the beach that is cemented by calcium carbonate from seawater washing through it in the intertidal to supratidal zone. In warm tropical shallow marine environments the seawater is often saturated with respect to calcium carbonate and cementation can take place on the sea floor forming a hardground or firmground if sedimentation rates are low. The cementation can be localised and related to microbial activity within the sediment, for example, it may be associated with burrows. Colder seawater is undersaturated with calcium carbonate and dissolution of carbonate material can occur. In non-marine environments calcite cementation occurs in both the vadose zone (above the water table) and in the phreatic zone (below the water table). In the vadose environment, for example in caves and in streams, the precipitation of the calcite to form these cements is due to the degassing of water: the resulting deposits are stalactites and stalagmites in caves (or speleothems, the general term for cave deposits), and travertine deposited from surface waters in places such as waterfalls. In soils calcite precipitation forms cements as rhizoliths and calcrete as a result of the evaporation of groundwater and the addition of calcium carbonate as wind-blown dust. Syn-sedimentary precipitation of siderite can occur where there is mixing of seawater and fresh water under reducing conditions: this can happen in coastal marshes. 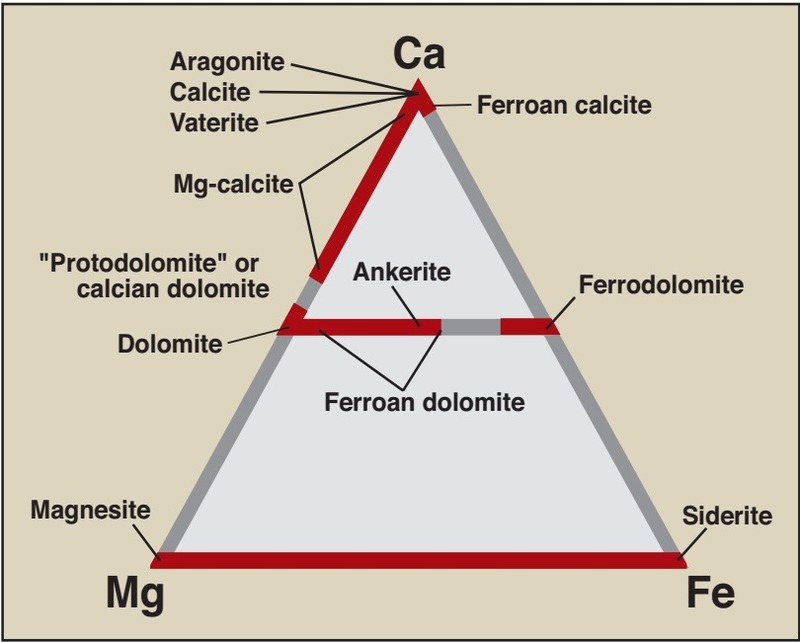 Burial stage (mesogenetic) cementation by calcite largely involves carbonate derived from the dissolution of carbonate grains. These cements are low magnesium calcite and are in the form of bladed crystals that grow out from the grain margins into the pore spaces or as overgrowths, particularly on crystalline fragments of echinoids and crinoids, from which they may develop a poikilotopic fabric. Calcite undergoes pressure dissolution under the pressure of a few hundred metres of overburden, forming solution surfaces within the rock known as stylolites. At a small scale (millimetres to centimetres), stylolites are usually highly irregular solution surfaces that are picked out by concentrations of clay, iron oxides or other insoluble components of the rock. Where a stylolite cuts through a fossil it may be possible to determine the amount of calcium carbonate that has been dissolved at the surface. They normally form horizontally in response to overburden pressure, but can also form in response to tectonic pressures at high angles to the bedding. At a larger scale, horizontal pressure solution surfaces within a limestone succession create apparent bedding surfaces that may be very sharply defined by the higher concentration of clay along the surface, but do not necessarily represent a break in sedimentation. This apparent bedding, which is diagenetic in origin, may be more sharply defined in outcrop than true bedding surfaces representing primary changes and breaks in deposition. Pressure solution can result in the removal of large amounts of calcium carbonate and concentrate the clay component of an impure, muddy limestone to leave nodules of limestone in a wavy-bedded mudstone. Dolomite is a calcium magnesium carbonate (CaMg (CO3)2) mineral that is found in carbonate sedimentary rocks of all ages and when the mineral forms more than 75% of the rock it is called a dolostone, although the term dolomite is also often used for the rock as well as for the mineral. The mineral is relatively uncommon in modern depositional environments: it is known to occur in small quantities in arid coastal settings, where its formation may be related to microbial activity. However, these modern examples do not provide an explanation for the thick successions of dolostone that are known from the stratigraphic record and most dolomite is believed to form diagenetically, a process known as dolomitisation. Many dolostones in the stratigraphic record contain fossils that indicate normal marine environments of deposition and show replacement fabrics where material that was clearly originally made up of calcite or aragonite has been wholly or partially replaced by dolomite. The mechanism of formation of dolomite by reaction of seawater and pore water with calcite and aragonite has been the subject of much debate and a number of different models have been proposed, all of which may be applicable in different circumstances. All models have certain things in common: the original rock must be limestone, the water that reacts with it must be marine, or pore water derived from seawater, and there must be abundant, long-term supply of those waters for large-scale dolomitisation to take place. The process of dolomitisation also seems to be favoured by elevated temperatures and by either enhanced or reduced salinities compared with seawater. The mixing-zone model for dolomitisation proposes that where fresh water, which is under-saturated with respect to calcite but over-saturated with respect to dolomite, mixes with marine waters then dolomitisation would occur. Although there may be a theoretical basis for this model, the process has not been observed in any of the many coastal regions around the world where conditions should be favourable. Arid coastal regions where concentrated brines promote dolomitisation have been suggested in the reflux model, but although this may result in formation of dolomite in the sediment within 1 or 2m of the surface, this mechanism does not seem to be capable of generating large volumes of dolomite. It seems more likely that large-scale dolomitisation occurs at some point after burial and hence a number of burial models or seawater models have been proposed. Thick successions of platform limestone can be transformed wholly or partly into dolostone if seawater, or pore-water brines that originated as seawater, can be made to pass through the rock in large quantities for long periods of time. Compaction has been suggested as a potential driving force for fluid transport, but seems unlikely to be capable of producing the quantities of fluids required. Thermally driven circulation, either by a geothermal heat source or by temperature differences between the interior of a platform and seawater, is the most likely candidate for generating long-term flow of the large quantities of fluid required. Topography can also provide a means of forcing water flow through rocks, but although meteoric waters (i.e. derived from rainfall) may provide an abundant flux of fluids, they rarely contain sufficient magnesium to promote dolomitisation. A reversal of the process that causes dolomitisation in association with evaporites can result in dolomite being replaced by calcite. This dedolomitisation occurs where beds of gypsum are dissolved enriching groundwaters in calcium sulphate. The sulphate-rich waters passing through dolostone result in the replacement of dolomite by calcite. Most carbonate sediments become lithified during diagenesis and can readily be cut to make thinsections: injection of blue resin into the pore spaces is nevertheless commonly carried out in order to make any voids within the rock visible. The blue-dyed resin shows up porosity in carbonate rocks that can either be between the grains (interparticle porosity) or within grains as intraparticle porosity, usually chambers within fossils such as foraminifers, cephalopods and gastropods. Distinguishing between cement and matrix and even between grains and cement is not always straightforward in carbonate rocks because all have the same, or very similar, mineralogy: the morphology of the carbonate material therefore provides most of the important clues as to its origin. Grains within limestone that are biogenic in origin usually have distinctive shapes that reflect the structure of the organism, even if they are only small fragments. Similarly, ooids and peloids are easily recognised in thin-sections. Lithic clasts of limestone and intraclasts have more variable shapes and structures and, because they are in fact pieces of rock, may include areas of cement: distinguishing between the cement within intraclasts and the later cement of the whole rock can sometimes be difficult. Peloids are typically made up of carbonate mud, and must therefore be distinguished from a muddy matrix on the basis of their shape. matrix in packstones, grainstones and boundstones. Individual grains are clay-sized and therefore cannot be individually seen with a petrographic microscope. Neomorphism (replacement by recystallisation) of carbonate mud to form microcrystalline sparry calcite commonly occurs, and as this results in an increase in crystal size, it may then be possible to see the crystalline form under the microscope: although it may be difficult to resolve individual crystals, the microspar appears as a mass of fine crystalline materials showing different birefringence colours under crossed polars. The birefringence colours of carbonates are high-order pink and green, which may appear to merge into a pale brown if the individual crystals are very small or the magnification is low. Shelly or skeletal material composed of aragonite undergoes replacement by calcite, either by the solution of the aragonite to create a void later filled by calcite, or by a direct mineral replacement. 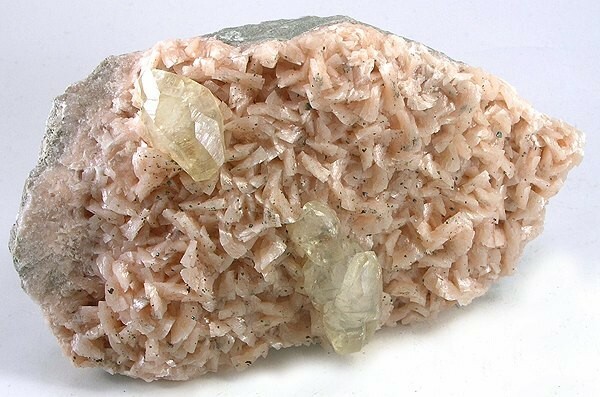 In the former case the internal structure is completely lost, but where the aragonite is transformed into calcite some relics of the original internal structure may be retained, seen as inclusions of organic matter. The neomorphic calcite crystals are larger than the original aragonite crystals, are often slightly brown due to the presence of the organic material and occur as an irregular mosaic occupying the external form of the skeletal material. Cementation ofcarbonate sediment to form a limestone can involve a number of stages of cement formation. The form of eogenetic cements is determined by the position of the sediment relative to the groundwater level. In the phreatic zone, in which all the pore spaces are filled with water, the first stage is the formation of a thin fringe of calcite or aragonite growing perpendicular to the grain boundary out into the pore space: these crystals form a thin layer of approximately equal thickness over the grains and are hence known as isopachous cement. Above the water level, in the intertidal and supratidal zones, the sediment is in the vadose zone and is only periodically saturated with water: the cement forms only where grains are close together within water held by surface tension to form a meniscus, and hence they are called meniscus cements. A bladed, fibrous or acicular morphology is characteristic of these early cements, with the long axes of the crystals oriented perpendicular to the grain edge. Very fine-grained, micritic, cements can also form at this stage. Recrystallisation of these eogenetic cements commonly occurs because if their original mineralogy was either aragonite or high-magnesium calcite they undergo change to low magnesium calcite through time. Many limestones have a cement of sparry calcite that fills in any pore space that is not occupied by an early cement. The interlocking crystals of clear calcite are believed to form during burial diagenesis (mesogenetic cement) from pore waters rich in calcium carbonate. If there are fragments of echinoids or crinoids present in the sediment the sparry cement precipitates as a syntaxial overgrowth and can form poikilotopic fabric as the cement crystals completely envelop a number of grains. The source of the calcium carbonate for these sparry cements may be from the dissolution of aragonite from shelly material or it may come from pressure solution at grain contacts and along stylolites. Most dolomite occurring in sedimentary rocks is diagenetic in origin, occurring as a replacement of calcite. Although the optical properties of calcite and dolomite are very similar, dolomite commonly occurs as distinctive, small rhomb-shaped crystals that replace the original calcite fabric. Staining the thin section with Alizarin Red-S provides confirmation that the mineral is dolomite (which does not stain pink) as opposed to calcite (which does). Extensive dolomitisation may completely obliterate the primary fabric of the limestone, resulting in a rock that appears in thin-section as a mass of rhombic crystals. The transformation of calcite into dolomite results in a decrease in mineral volume and consequently an increase in porosity. As a result of the global rise in sea level and inappropriate development in the coastal zone, coastal erosion is becoming recognized as a serious national and worldwide problem. Coastal erosion is generally a more continuous, predictable process than other natural hazards, such as earthquakes, tropical cyclones, or floods, and large sums of money are spent in attempts to control it. If extensive development of coastal areas for vacation and recreational living continues, coastal erosion will certainly become a more serious problem. The concept of littoral cell is important in coastal processes involving sand transport to, along and from a beach (that is a budget). 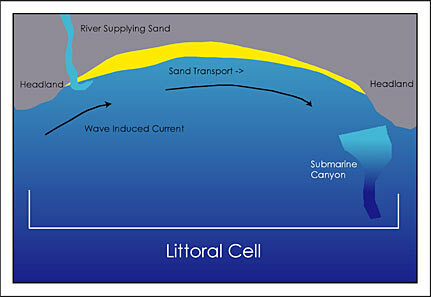 A littoral cell is a segment of coast that includes an entire cycle of sediment delivery to the coast (mostly by rivers but also coastal erosion), long-shore sediment transport, and eventual loss of sediment from the near-shore environment (for examples, sediment may be flushed down a submarine canyon that heads in the surf zone or move inland to be part of sand dunes). An easy way to visualize beach erosion at a particular beach is to take a beach budget approach. An analogy to the budget is your bank account. You deposit money at regular or not so regular times. Some money is in storage, and that is your account balance; and you periodically withdraw funds, which is output. Similarly, we can analyse a beach in terms of input, storage, and output of sand or larger sediment that may be found on the beach. Input of sediment to a beach is by coastal processes that move the sediment along the shoreline or produce sand from erosion of a sea cliff or sand dunes on the upper part of a beach. The sediment that is in storage on a beach is what you see when you visit the site. Output of sediment is that material that moves away from the site by coastal processes similar to those that brought the sediment to the beach. If input exceeds output, then the beach will grow, as more sediment is stored and the beach widens. If input and output are relatively equal to one another, the beach will remain in a rough equilibrium at about the same width. If output of sediment exceeds input, then the beach will erode and there will be fewer grains of sediment on the beach. Thus, we see that the budget represents a balance of sand on the beach over a period of years. Short-term changes in sediment supply due to the attack of storm waves will cause seasonal or storm-related changes to the supply of sediment on a beach. Long-term changes in the beach budget caused by climate change or human impact cause long-term growth or erosion of a beach. The sand on many beaches is supplied to the coastal areas by rivers that transport it from areas upstream, where it has been produced by weathering of quartz- and feldspar-rich rocks. We have interfered with this material flow of sand from inland areas to the beach by building dams that trap the sand. As a result, some beaches have become deprived of sediment and have eroded. Damming is not the only reason for erosion. For example, beach erosion along the East Coast is a result of tropical cyclones (hurricanes) and severe storms, known as Northeasters or Nor easters;3 a rise in sea level; and human interference with natural shore processes. Sea level is rising around the world at the rate of about 2 to 3 mm (0.08 to 0.12 in.) per year, independent of any tectonic movement. Evidence suggests that the rate of rise has increased since the 1940s. The increase is due to the melting of the polar ice caps and thermal expansion of the upper ocean waters, triggered by global warming that is, in part, related to increased atmospheric carbon dioxide produced by burning fossil fuels. Sea levels could rise by 700 mm (28 in.) over the next century, ensuring that coastal erosion will become an even greater problem than it is today. When a sea cliff (a steep bluff or cliff) is present along a coastline, additional erosion problems may occur because the sea cliff is exposed to both wave action and land erosion processes, such as running water and landslides. These processes may work together to erode the cliff at a greater rate than either process could alone. The problem is further compounded when people interfere with the sea cliff environment through inappropriate development. The rocks of the cliff are steeply inclined and folded shale. A thin veneer of sand and coarser material, such as pebbles and boulders, near the base of the cliff covers the wave-cut platform, which is a nearly flat bench cut into the bedrock by wave action. A mantle of sand approximately 1 m (3.3 ft) thick covers the beach during the summer, when long, gentle, spilling breakers construct a wide berm, while protecting the sea cliff from wave erosion. During the winter, plunging breakers, which have a high potential to erode beaches, remove the mantle of sand and expose the base of the sea cliff. Thus, it is not surprising that most erosion of the sea cliffs in southern California takes place during the winter. A variety of human activities can induce sea cliff erosion. Urbanization, for example, results in increased runoff. If the runoff is not controlled, carefully collected, and diverted away from the sea cliff, serious erosion can result. Drainpipes that dump urban runoff from streets and homes directly onto the sea cliff increase erosion. Drainpipes that route runoff to the base of the sea cliff on the face of the beach result in less erosion. Watering lawns and gardens on top of a sea cliff may add a good deal of water to the slope. This water tends to migrate downward through the sea cliff toward the base. When water emerges as small seeps or springs from a sea cliff, it effectively reduces the stability of the sea cliff, facilitating erosion, including landslides. Landslides, from many small to few large, occur along a sea cliff as a result of wave erosion at the base of the sea cliff. Numerous small landslides produce the irregular shape (wavy) along the top of a sea cliff. Structures, such as walls, buildings, swimming pools, and patios, near the edge of a sea cliff may also decrease stability by adding weight to the slope, increasing both small and large landslides. Strict regulation of development in many areas of the coastal zone now forbids most risky construction, but we continue to live with some of our past mistakes. 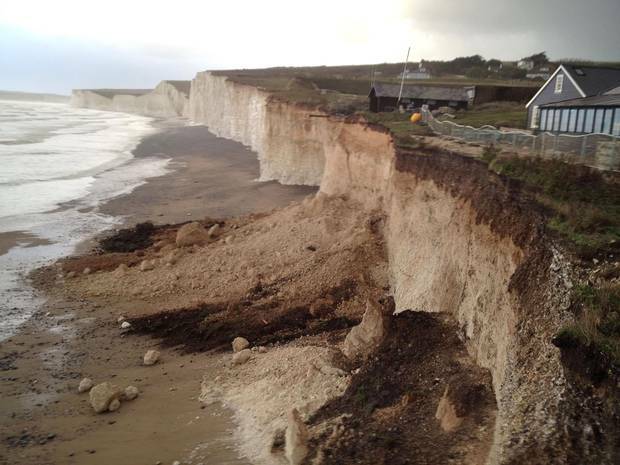 The rate of sea cliff erosion is variable, and few measurements are available. Near Santa Barbara, California, the rate of sea cliff erosion averages 15 to 30 cm (6 to 12 in.) per year. 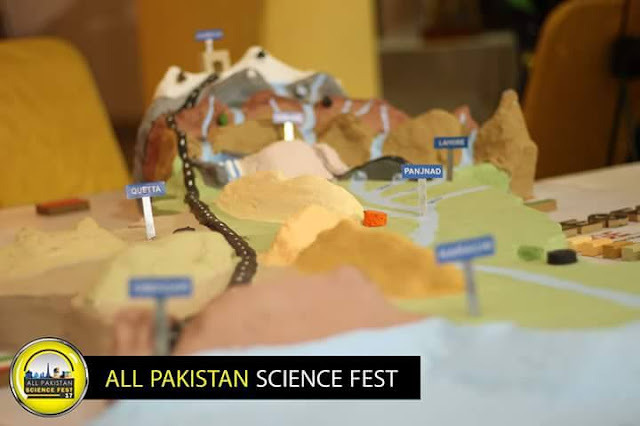 These erosion rates are moderate compared with those in other parts of the world. 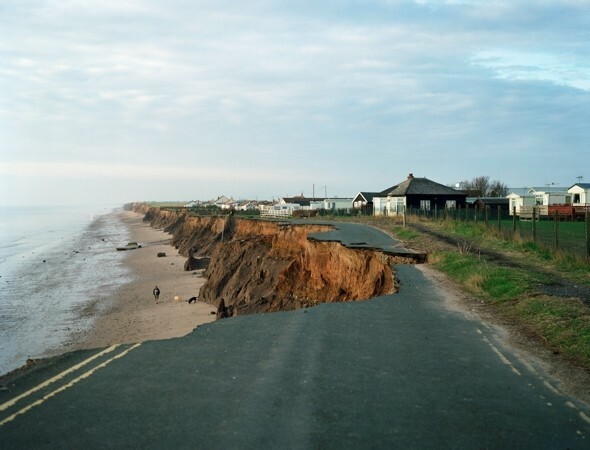 Along the Norfolk coast of England, for example, erosion rates in some areas are about 2 m (6.6 ft) per year. The rate of erosion is dependent on the resistance of the rocks and the height of the sea cliff.6 The rate of coastal erosion can be determined using remote sensing. Sea cliff erosion is a natural process that cannot be completely controlled unless large amounts of time and money are invested, and, even then, there is no guarantee that erosion will cease. Therefore, it seems we must learn to live with some erosion. It can be minimized by applying sound conservation practices, such as controlling the water on and in the cliff and not placing homes, walls, large trees, or other structures that contribute to driving forces close to the top edge of a cliff. The Indonesian province of Papua had experienced a powerful earthquake of magnitude 7.0 recorded by the U.S Geological Survey. The earthquake just struck off on 27/7/2015 at 06.41 a.m. local time where the epicentre was 250 kilometres west of the provincial capital Jayapura and was at the depth of 52 kilometres. As the area is largely vegetated and mountainous region, there was no tsunami warning issued after the Earthquake. The Australian government and Hawaii tsunami monitoring system has declared the no tsunami threat. In March 2012 a 6.2-magnitude earthquake struck the region without any tsunami warning issued or loss or reports of damage. One of Irian Jaya’s worst earthquakes was in 1981, which killed at least 305 people and displaced more than a 1,000 villagers in the district of Kurina Areal, near the border of Papua New Guinea. An official of the Indonesia's Meteorology and Geophysics Agency said the quake was felt across the province and that the strongest hit area was Sarmi, a town on the northern coast of the island, but there were no immediate reports of injuries or damage. But it did cause panicked residents to ran out of their homes, said Sutopo Purwon Nugroho, a spokesman for the National Disaster Mitigation Agency. 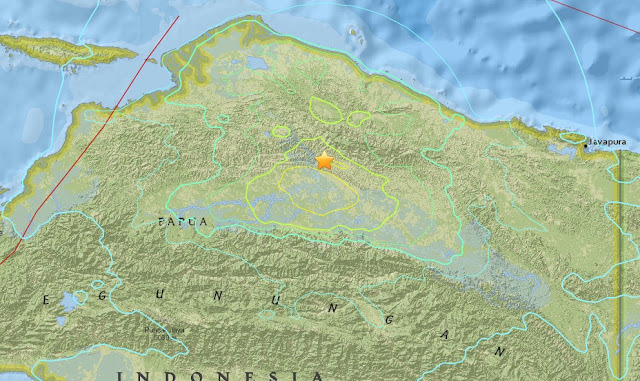 Indonesia is prone to earthquakes due to its location on the so-called Pacific "Ring of Fire." A massive earthquake off Sumatra island in 2004 triggered a tsunami that killed 230,000 people in a dozen countries, mostly in Indonesia's Aceh province. Waves that batter the coast are generated by offshore storms, sometimes thousands of kilometres from the shoreline where they will expend their energy. Wind blowing over the water produces friction along the air-water boundary. Since the air is moving much faster than the water, the moving air transfers some of its energy to the water, resulting in waves. The waves, in turn, eventually expend their energy at the shoreline. The velocity, or speed, of the wind. The greater the wind velocity, the larger the waves. The duration of the wind. Storms of longer duration have more time to impart energy to the water, producing larger waves. The distance that the wind blows across the surface, or fetch. The longer the fetch, the larger the waves. Within the area of the storm, the ocean waves have a variety of sizes and shapes, but, as they move away from their place of origin, they become sorted out into groups of similar waves. These groups of waves may travel for long distances across the ocean and arrive at distant shores with very little energy loss. The important parameters are wave height(H), which is the difference in height between the waves trough and its peak, and wave length (L), the distance between successive peaks. The wave period (T) is the time in seconds for successive waves to pass a reference point. If you were floating with a life preserver in deep water and could record your motion as waves moved through your area, you would find that you bob up, down, forward, and back in a circular orbit, returning to about the same place. If you were below the surface with a breathing apparatus, you would still move in circles, but the circle would be smaller. That is, you would move up, down, forward, and back in a circular orbit that would remain in the same place while the waves travelled through. When waves enter shallow water at a depth of less than about one-half their wavelength (L), they feel bottom. The circular orbits change to become ellipses; the motion at the bottom may be a very narrow ellipse, or essentially horizontal, that is, forward and back. You may have experienced this phenomenon if you have stood or have swum in relatively shallow water on a beach and felt the water repeatedly push you toward the shore and then back out toward the sea. 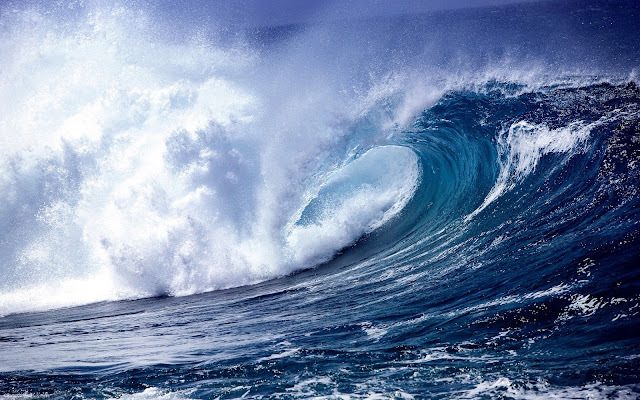 The wave groups generated by storms far out at sea are called swell.As the swell enters shallower and shallower water, transformations take place that eventually lead to the waves breaking on the shore. For deep-water conditions, there are equations to predict wave height, period, and velocity, based on the fetch, wind velocity, and length of time that the wind blows over the water. This information has important environmental consequences: By predicting the velocity and height of the waves, we can estimate when waves with a particular erosive capability generated by a distant storm will strike the shoreline. We have said that waves expend their energy when they reach the coastline. But just how much energy are we talking about? The amount is surprisingly large. For example, the energy expended on a 400 km (250 mi) length of open coastline by waves with a height of about 1 m (3.3 ft) over a given period of time is approximately equivalent to the energy produced by one average-sized nuclear power plant over the same time period. Wave energy is approximately proportional to the square of the wave height. Thus, if wave height increases to 2 m (6.6 ft), the wave energy increases by a factor 4. If wave height increases to 5 m (16 ft), which is typical for large storms, then the energy expended, or wave power, increases 52, or 25 times over that of waves with a height of 1 m (3.3 ft). When waves enter the coastal zone and shallow water, they impinge on the bottom and become steeper. Wave steepness is the ratio of wave height to wave length. Waves are unstable when the wave height is greater than about 10 percent (0.1) of the wave length. As waves move into shallow water, the wave period remains constant, but wave length and velocity decrease and wave height increases. The waves change shape from the rounded crests and troughs in deep water to peaked crests with relatively flat troughs in shallow water close to shore. Perhaps the most dramatic feature of waves entering shallow water is their rapid increase in height. The height of waves in shallow water, where they break, may be as much as twice their deep-water height. Waves near the shoreline, just outside the surf zone, reach a wave steepness that is unstable. The instability causes the waves to break and expend their energy on the shoreline. Although wave heights offshore are relatively constant, the local wave height may increase or decrease when the wave front reaches the near-shore environment. This change can be attributed to irregularities in the offshore topography and the shape of the coastline. The offshore topography is similar to that of the coastline. As a wave front approaches the coastline, the shape of the front changes and becomes more parallel to the coastline. This change occurs because, as the waves enter shallow water, they slow down first where the water is shallowest, that is, off the rocky point. The result is a bending, or refraction, of the wave front. Owing to the bending of the wave fronts by refraction, there is a convergence of the wave normals at the headland, or rocky point, and a divergence of the wave normals at the beaches, or embayments. Where wave normals converge, wave height increases; as a result, wave energy expenditure at the shoreline also increases. The long-term effect of greater energy expenditure on protruding areas is that wave erosion tends to straighten the shoreline. The total energy from waves reaching a coastline during a particular time interval may be fairly constant, but there may be considerable local variability of energy expenditure when the waves break on the shoreline. In addition, breaking waves may peak up quickly and plunge or surge; or they may gently spill, depending on local conditions, such as the steepness of the shoreline and the height and length of waves arriving at the shoreline from a distant storm. Plunging breakers tend to be highly erosive at the shoreline, whereas spilling breakers are more gentle and may facilitate the deposition of sand on beaches. The large plunging breakers that occur during storms cause much of the coastal erosion we observe. A beach is a land form consisting of loose material, such as sand or gravel, that has accumulated by wave action at the shoreline. Beaches may be composed of a variety of loose material in the shore zone, the composition of which depends on the environment. For example, many Pacific island beaches include broken bits of shell and coral; Hawaiis black sand beaches are composed of volcanic rock; and grains of quartz and feldspar are found on the beaches of southern California. The landward extension of the beach terminates at a natural topographic and morphologic change, such as a sea cliff or a line of sand dunes. The berms are flat back shore areas on beaches formed by deposition of sediment as waves rush up and expend the last of their energy. Berms are where you will find people sunbathing. The beach face is the sloping portion of the beach below the berm, and the part of the beach face that is exposed by the up rush and backwash of waves is called the swash zone. The surf zone is that portion of the seashore environment where turbulent translational waves move toward the shore after the incoming waves break; the breaker zone is the area where the incoming waves become unstable, peak, and break. The long shore trough and long shore bar are an elongated depression and adjacent ridge of sand produced by wave action. A particular beach, especially if it is wide and gently sloping, may have a series of long shore bars, long shore troughs, and breaker zones. The sand on beaches is not static; wave action keeps the sand moving along the beach in the surf and swash zones. A long shore current is produced by incoming waves striking the coast at an angle. Because the waves strike the coast at an angle, a component of wave energy is directed along the shore. If waves arrive at a beach perfectly parallel to the beach, then no long shore current is generated. The long shore current is a stream of water flowing parallel to the shore in the surf zone. This current can be surprisingly strong. 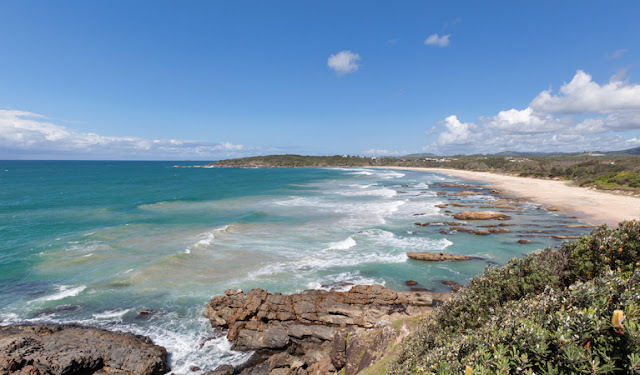 If you are swimming on a beach and wading in and out of the surf zone, you may notice that the longer you go in and out through the surf zone, the further away you are from where you started and left your beach towel and umbrella. As you move in and out through the surf and swash zone, the current will move you along the coast, and the sand is doing exactly the same thing. The process that transports sand along the beach, called long shore sediment transport, has two components: (1) Sand is transported along the coast with the long shore current in the surf zone; and (2) the up-and-back movement of beach sand in the swash zone causes the sand to move along the beach in a zigzag path. Most of the sand is transported in the surf zone by the long shore current. The direction of transport of sand along beaches in the United States is generally from the north to the south for beaches on both the East and West Coasts of the country. Although most of the transport is to the south, it can be variable and depends upon the wave action and in which direction they strike the shore. The amount of sand transported along a beach, whether we are talking about Long Island, New York, or Los Angeles, California, is surprisingly large, at several hundred thousand cubic meters of sediment per year. Having said this, the amount of sand transported on a given day or period of days is extremely variable. On many days, little sand is being transported, and on others the amount is much larger. Most of the sediment is transported during storms by the larger waves. When a series of large waves arrives at a coastline and breaks on the beach, the water tends to pile up on the shore. 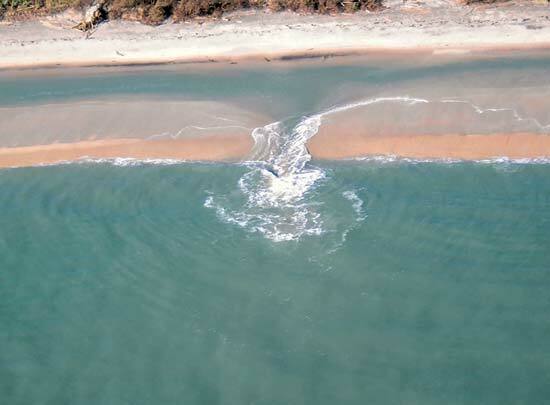 The water does not return as it came in, along the entire shoreline, but is concentrated in narrow zones known as rip currents. Beach goers and lifeguards call them rip tides or undertow. They certainly are not tides, and they do not pull people under the water, but they can pull people offshore. In the United States, up to 200 people are killed and 20,000 people are rescued from rip currents each year. Therefore, rip currents constitute a serious coastal hazard to swimmers, killing more people in the United States on an annual basis than do hurricanes or earthquakes; the number of deaths caused by rip currents is equivalent to the number caused by river flooding. People drown in rip currents because they do not know how to swim or because they panic and fight the current by trying to swim directly back to shore. Winning a fight with a rip current is nearly impossible because the current can exceed 6 km per hour (4 mi per hour), a speed that even strong swimmers cannot maintain for long. A swimmer trying to fight a rip current soon becomes exhausted and may not have the energy to keep swimming. Fortunately, rip currents are usually relatively narrow, a few meters to a few tens of meters wide, and they dissipate outside of the surf zone, within tens to hundreds of meters offshore. To safely escape a rip current, a swimmer must first recognize the current and then swim parallel to the shore until he or she is outside the current. Only then should the swimmer attempt to swim back to shore. The key to survival is not to panic. When you swim in the ocean, watch the waves for a few minutes before entering the water and note the surf beat, the regularly arriving sets of small and larger waves. Rip currents can form quickly after the arrival of a set of large waves. They can be recognized as a relatively quiet area in the surf zone where fewer incoming waves break. You may see the current as a mass of water moving out through the surf zone. The water in the current may also be darker, carrying suspended sediment. Remember, if you do get caught in a rip current, do not panic; swim parallel to the shore until you are outside the current, then head back to the beach.